A beautiful town residing alongside Italy's famous Amalfi Coast, many tourists consider Positano to be one of the most picturesque of all Italy's coastal resorts. That said, tourists visiting Positano should bear in mind that this is a town with steep streets and more than its fair share of stairways, with many colourful pastel houses crammed on the hillside next to the beachfront, competing with each other for the best sea view. When you first arrive in Positano, do consider paying the tourist information office a visit. Located on the Via del Saracino, next to the Via dei Mulini and the central Piazza Flavio Gioia, this tourist information outlet is conveniently close to one of the town's most famous sights, the Chiesa di Santa Maria Assunta. Although tourism has grown to become fairly integral to the nature of today's Positano, the town does manage to retain elements of its past, when it was little more than a tiny fishing village. The town is undeniably a very special, unique and 'real' part of Campania, boasting dramatic cliff-hugging roads, popular beachfronts and some of the very best views that you are ever likely to experience. Apart from the beaches and water sports, other tourist attractions include cruises along the Amalfi Coast, the very beautiful Bay of Salerno, and a choice of walking trails, with a very appealing cliff side path connecting the Spiaggia Grande and Spiaggia del Fornillo beaches. 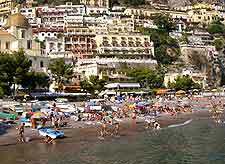 More information about Positano Tourist Attractions. Away from Positano's beaches are a number of very different tourist attractions. The Town Hall is a central landmark in the town and features a large balcony overlooking the sea, where many people choose to get married each week. Famed for its majolica tile-clad dome and tall stone pillars, the Chiesa di Santa Maria Assunta is amongst the oldest landmarks in Positano, dating back as far as the 10th century. Even older and created by nature, the sea cavern known as the Emerald Grotto (Grotta dello Smeraldo) is always very popular with tourists and holiday makers, and guided tours through the illuminated chambers take place on boats. 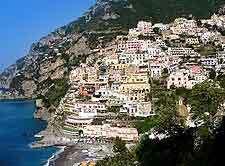 More information about Positano Tourist Landmarks and Monuments. Whilst there are no real museums of note within the town of Positano, there is plenty of history, particularly nearby. If you are able to take a few day trips, then nearby Naples is home to a very impressive selection of museums, with plenty of historical information about Campania. Alternatively, take a short excursion to Pompeii or Herculaneum and learn more about the Roman culture that once flourished in these ancient Roman towns, which are really like giant open-air museums, filled with treasures around every corner. 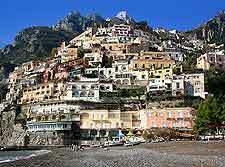 More information about Positano Museums and Positano Art Galleries. 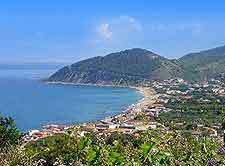 Campania is a very popular part of Italy and has much to offer visiting tourists. During the summer, the town's waterfront is bustling with ferries, hydrofoils and other boats, which whisk people to destinations such as Amalfi, Naples, Ravello and Sorrento. The isle of Capri is especially close to Positano and makes for a very worthwhile day trip, offering everything from glorious sandy beaches and Mediterranean 'sea caves', to historic sights around the centrally located Piazza Umberto. 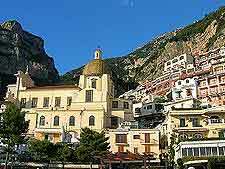 More information about Positano Attractions Nearby.